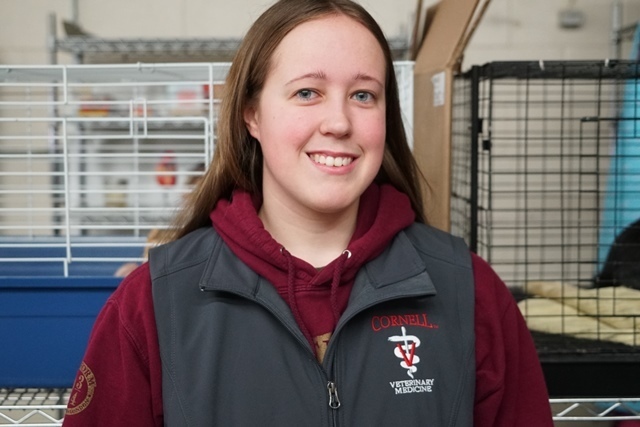 A graduate of the Veterinary Practices program at the Howard G. Sackett Technical Center will soon be attending Cornell University to pursue her dream of being a veterinarian. Cheyenne Lee, a 2013 graduate of Beaver River Central School, attended the BOCES program during her junior and senior years in high school. She says her love of animals and career goal to be a veterinarian led her to the Vet Practices classroom. Veterinary Practices Instructor Blake Place says she witnessed lots of growth in Cheyenne during her two years enrolled in the program. Not only through her participation with projects in the classroom, but through her time with the SkillsUSA program as well. Cheyenne was a state officer with the New York State Chapter, serving as the Parliamentarian for regional and state meetings that involved other students from across New York. Cheyenne says her two years in the Veterinary Practices exposed her to various aspects of veterinary and animal sciences that she wouldn’t have considered before enrolling. Upon her 2013 graduation, Cheyenne attended SUNY Cobleskill and earned a four-year degree in Animal Science. She applied for the Veterinary Program at Cornell University, was accepted and will begin attending classes there in the fall of 2018. Until then, Cheyenne is working and saving up for school through a job at Kraft Foods in Lowville and is also in training to be a whitewater rafting guide this summer. Her advice for those wishing to follow a similar path is to plan ahead and be prepared for hard work. She also recommends the Veterinary Practices program for those interested in the field.